Guang Yi Company Limited is one of the largest wholesale suppliers and buyers of used and 14-day Mobile Phones. * Over 20 years of experiences and dedications in mobile phone industry with an annual turnover of US$200 million* Supply an extensive range of second hand mobile phones from IPhone's, BlackBerry's, Samsung's, Sony's, HTC's and Nokia's device to name a few with tens of millions of dollars of goods always in stock* Directly buy from 32 global major telecom operators* Subsidiaries or recycling networks across 20 countries in Europe, America, Oceania and Asia, with both a customer base and a supplier base all over the world* Maximize the value of second hand mobile phones to minimize environmental riskPlease contact us for more details. 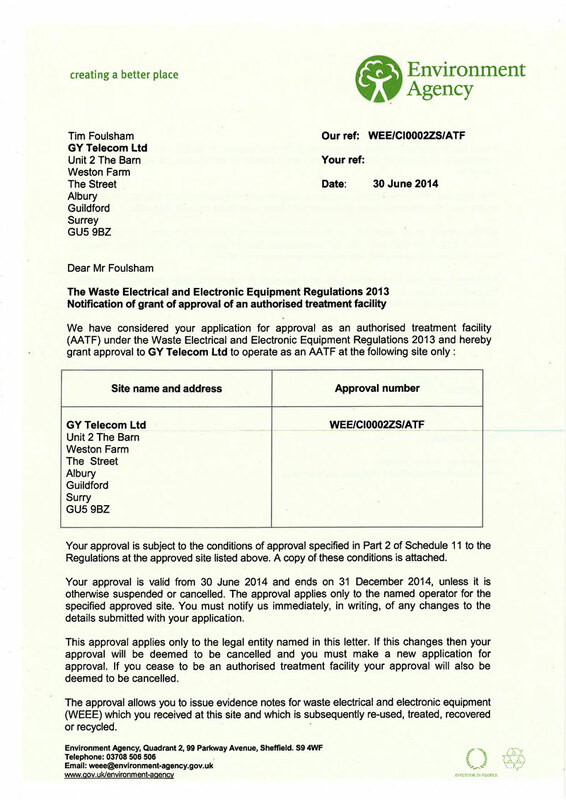 The Environmental Permitting (England and Wales) Regulations 2010 CONFIRMATION OF REGISTRATION Name of the establishment or undertaking: GY Telecom Ltd T/a Topdollarmobile Location of the activity: Unit 2 The Barn, Weston Farm, The Street, Albury, Guildford, Surrey, GU5 9BZ Date of Registration: 22/11/2012 With reference to your submission received on 16/11/2012, to carry out the repair or refurbishment of Waste Electrical and Electronic Equipment under waste exemption T11 of the above Regulations at the above site. 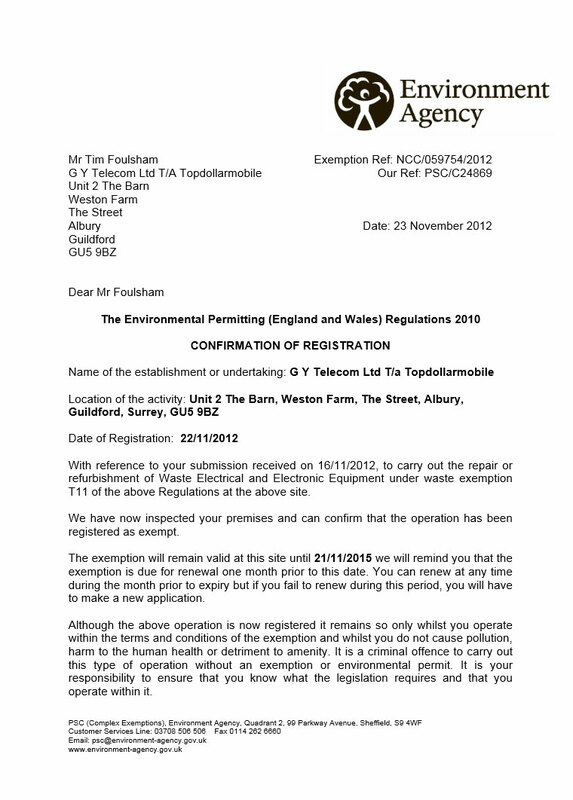 We have now inspected your premises and can confirm that the operation has been registered as exempt. The exemption will remain valid at this site until 21/11/2015. 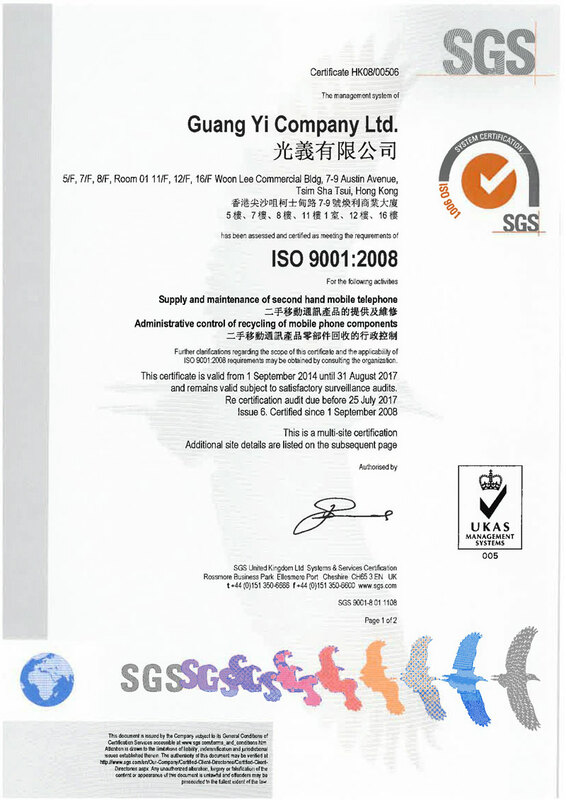 Guang Yi Company Limited has been assessed and certified as meeting the requirements of ISO 9001:2008 for the following activities: Supply and maintenance of second hand mobile telephone Administrative control of recycling of mobile phone components. 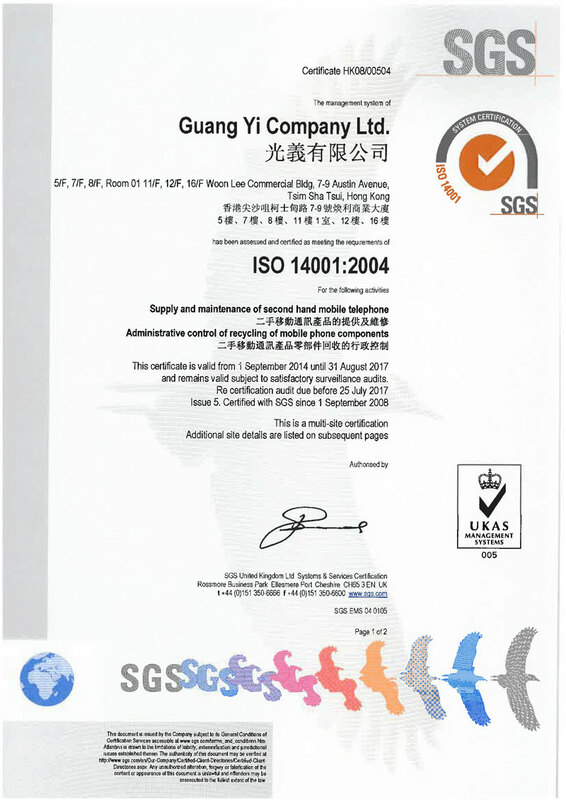 Guang Yi Company Limited has been assessed and certified as meeting the requirements of ISO 14001:2004 for the following activities: Supply and maintenance of second hand mobile telephone Administrative control of recycling of mobile phone components.